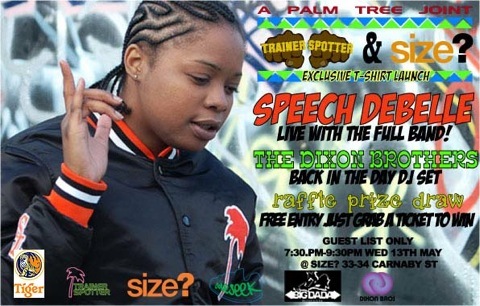 Datarhyme provided the PA system for the Speech Debelle live showcase at Size? in Carnaby Street on the 13th May 2009. Speech Debelle performed with a live band which features drums, double and an acoustics guitar. The show also featured DJs, The Dixon Bros who entertained the crowd before and after the showcase. Datarhyme was commissioned for this job after provided the PA for events at the Carhartt Store.